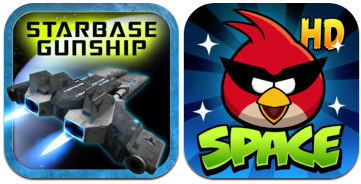 What I Played this Week - Angry Birds Space HD, and Starbase Gunship! Two awesome 99 cent titles this week, and likely my last WIPTW article of 2012, so a happy holidays to everyone, and here is hoping you have a great new year in 2013! Starbase Gunship is a new game from Capital j Media. A stationary 3D shooting game that puts you at the center of the action as enemy ships and incoming weapons head toward your base station. Blasting through and surviving enemy waves will allow you to build up enough creds to update your base firepower and protection levels. Angry Birds Space HD is pig busting in zero-G, and like every other Angry Birds (all of which are currently on sale), powerfully addictive. Starbase Gunship is rendered via the Unity game engine, with what I consider decent graphics for a basic space shooting game. I liked both the overall look of the playing area, the attractive menus and especially the HUD enemy tracking; reminiscent of aviation radar tracking icons, which lends a compelling touch. While the graphics aren't going to knock games like ShadowGun, Dead Trigger, or Galaxy on Fire out of their top spots, the shading and effects are nicely done. The music is a little repetitive, but of production quality. Overall, a great version 1 effort for an indie game like this. The point of SG is to defend your star-base. Your perspective is centered above the station (the gun turret on the belly of the advanced gunship). The ship itself is a prop, as it doesn't move around at all or add any capability that I can tell other than to look kind of cool. Your point of presence could have been a turret or something on top of the station, but I guess the ship provides more of a bird's-eye view of incoming enemy. Enemy ships and missiles approach from various sectors below you, and the warning system will send you an audible as well as on-screen cues before they appear on-screen. You swipe to pan and locate the threats (a red arrow will appear to guide you), and hopefully obliterate them before they strike your station. At least in the early phases I played, the enemies all seem to stay on a pretty straight track, which can become a bit tedious. It starts to feel a bit more like tower defense than an action-packed space shooter. The standard laser mounted weapon runs out of charge quickly, requiring you to wait for reload. As you smash enemy waves (mostly scout ships at the beginning), you earn cumulative credits, which can be used for better guns (vulcan, mass driver, missle launcher are the options currently available). You can also upgrade the base's armor, buy a 1-time auto-repair option (repairs damage automatically at 50%), or save up for a generator (to increase your weaps lifecycle) or maybe a nuke or 2 to take out a whole wave. I had a minor gripe with the zoom feature, which allows you to magnify distant targets to increase your accuracy. You need to remember to zoom back out before panning to locate a new wave of enemies, otherwise engage in serial swiping that will cost valuable time (and try your patience as well). The zoom is a good feature, but maybe could have a smarter pan capability that auto tracks to each sector or target when engaged. The developer is considering options and enhancements in this regard, and also thinking of adding some new modes of play. Overall, I think the game is outstanding, (if a little repetitive) for an initial release and do recommend it. I am looking forward to see what enhancements are added, but at 99 cents, it's a steal. I never really try to seriously review games like Angry Birds. Occasionally (very rarely), a gaming PR rep will approach me about a new game like this (or I'll approach them, if I really want to try a game), but the truth is, I don't consider myself to be hard-core enough to do a game review for games like Shadow Gun, Dead Trigger (though I did actually in both cases) or even Angry Birds the justice they deserve. The main reason is that I review a lot of different tech (and work a day job too), so I just don't have the time to delve into any game at that level. However, I nabbed Angry Birds Space HD for personal time-killing reasons this holiday and loved it so much, had to write something about it. Let's just call this a summary review, as far better gamer review sites out there have long since covered this game. To the uninitiated--like 2 people maybe living on a deserted island somewhere--Angry Birds is about killing pigs. The reasons don't matter (though, there is a pig vitriol-laden backstory here), but suffice to say the birds are mad, and want to be launched (via oversized slingshot) at any dwelling the pigs inhabit, thereby hopefully smashing it and the pigs to smithereens. I never really explored much past the original title, which I snagged for free on a non-iOS device I was reviewing at the time. The game physics are impeccable, of course. Though cartoonish in rendering, wood, glass and stone react to the various bird weapon kinetics in a pleasingly realistic audio and visual fashion. I was hooked, but drifted away to other games eventually (thankfully). Due to stupid iTunes enticements, I finally succumbed to trying Space. What a waste of my time that poor decision has turned out to have caused. My valuable time (and tons of it), spent launching the bird-projectiles in around and through various gravity wells in the expanses of open space, or even more bazaar settings (you have to see the Utopia level to understand). The game is even more amazingly addictive than the terrestrial counterparts, so I hope that this renewed pig-smashing fervor also wears off. Space adds more great bird weapon types to the typical arsenal (freezing and balloon bird--if that's what they are called? ), a time warp to hidden levels, and the ominously destructive Space Eagle bonus. You will definitely learn a thing or 2 about the conservation of angular momentum playing Angry Birds Space HD. Rovio is running a sale on the whole lineup at the time I wrote this, so be a good time to grab them all. Perfect for holiday time-killing! That's it for this edition of WIPTW (What I Played this Week)...You can grab both of the great games mentioned in this review at the links above, and check back here regularly on our iPhoneLife blogs for more great news, reviews, tips, and tricks! !